Concert ... review? » Rock legends Def Leppard bring 1980s hooks and hits to amphitheater; Tribune writer gets carried away with tongue-in-cheek puns. 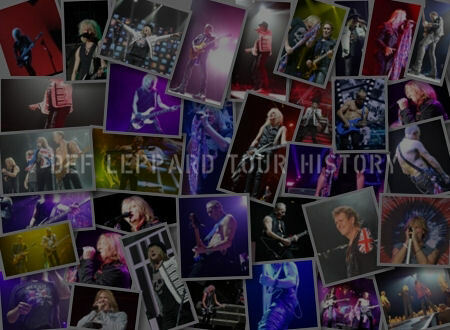 West Valley City - Thousands of attendees at Monday night's Def Leppard concert at USANA Amphitheatre who began the evening prepared for some "Rock of Ages" were said to have been mysteriously overcome by "Hysteria" at the show. Though officials could not pinpoint an exact cause, some concertgoers attributed the outbreak to "Love Bites" from an undetermined "Animal," while others claimed the area had been hit by a "Rocket" carrying an unknown payload. Many delirious victims were overheard nonsensically instructing attending medical personnel to "Pour Some Sugar On Me," while others lamented that they'd be left "Two Steps Behind" "When Love and Hate Collide." Still others, curled up in a fetal position, were heard to be dejectedly asking of no one, "Have You Ever Needed Someone So Bad?" Symptoms also included those affected insisting it was "Too Late for Love," and subsequently exhorting each other, "Let's Get Rocked." On-site officials pleaded for calm, noting victims would only be "Bringin' on the Heartbreak" by doing so. Attendees were reportedly undeterred, however, with many alleging such claims were nothing more than "Foolin" — a response that prompted one official, who requested anonymity, to privately speculate that should symptoms persist, the mass of humanity could eventually "Armageddon It." A Tribune journalist was able to "Photograph" the evening's events as they unfolded. By The Salt Lake Tribune 2017. At this point in their relationship, Def Leppard and sold-out USANA Amphitheatre concert audiences are like the old married couple that complete each other's sentences. For example, "What do you want, what do you want?" 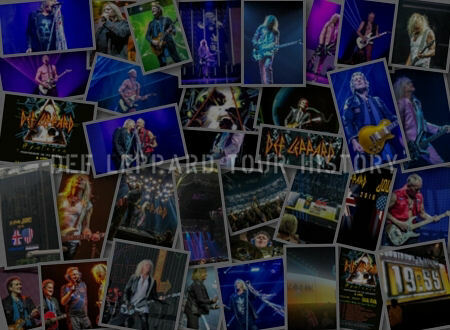 yelled out frontman Joe Elliott on Monday night during the ever-enduring anthem "Rock of Ages." "I want rock and roll," the USANA crowd knowingly and without hesitation screamed back to him, somewhat in melody. Or there was the moment where Elliott sand "Sorry, dad, gotta disappear" and, upon his prompting, the audience immediately responded, "Let's get the rock out of here" during "Let's Get Rocked." And symptomatic of many long-term relationships, the memory also starts to get a little fuzzy. "This is amazing," Elliott said to the adoring crowd three songs into Monday's performance. "This is the sixth time we've played here. It's sold out ... that's six for six!" For the record, Monday's concert was Def Leppard's ninth visit to the venerable West Valley venue -- in just a span of 11 years. (Yes, most of those, if not all, have been sellouts.) Elliott can certainly be forgiven as the tours are all starting to run together a little bit at this point. I'm not sure there was actually a whole lot to distinguish Monday's performance from the band's visit last September. The setlist, for example, was exactly the same, and the staging and video board graphics appeared to be mostly the same as well. Even the specific song introductions were hauntingly familiar. 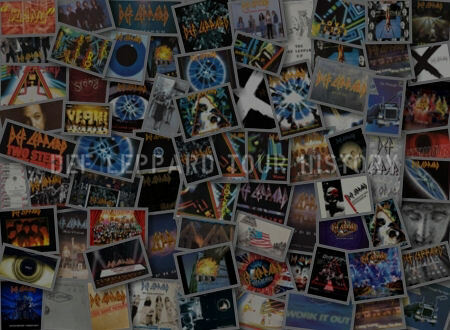 But it's not like the British hard rockers are re-inventing the concert wheel at this point in their stellar career -- which as Elliott pointed out Monday, is hitting the 40-year milestone. The band remains a great concert draw because it still churns out a high-quality, high-energy performance every single night. You've got to admire that. Another admirable trait is the band's dedication to continually make new music instead of entirely resting on its laurels. It's true that 90 percent of each tour's setlist is pretty much determined before the group even dreams of hitting the road each summer. That's a great problem to have, and Monday's set was chock full of all the old standbys: "Animal," "Foolin'," "Love Bites," "Armageddon It," "Rocket," "Hysteria," "Pour Some Sugar on Me," "Photograph," etc. Still, the band highlighted three songs off its latest release -- last year's eponymously titled CD. The band kicked things off with "Let's Go," which lyrically makes it an ideal opening number. ("Welcome to the carnival, welcome to the party, welcome to the edge of your seat.") The hooky "Dangerous" made an appearance three songs later and the funky, bass-heavy "Man Enough" was placed mid-set. The newer songs slipped into the tried and true quite nicely. Phil Collen and Vivian Campbell are both remarkable guitarists who make the rather difficult look ridiculously easy. They each have different stage demeanors, however, with Collen being the more animated and flashy performer while Campbell is a tad more reserved. Some of the best parts of the night were when the two came together, walking down the ramp into the audience, doubling on guitar solos like the beautiful melodic one in "Hysteria" or the full-on jamfest of the instrumental "Switch 625." During one humorous segment of "Let's Get Rocked," Collen came over to Campbell's Stage Right perch, caught the eye of fans in the very front of the audience and pointed back to Campbell a few feet behind him. After Campbell played his line, Collen then animatedly pointed at his own guitar and said, "Watch this!" He responded with the guitar part in the song which mimics a classical violin run. It is fan interactions like that which help serve to differentiate various shows and make them seem more personable. Def Leppard is good at that. Drummer Rick Allen and bassist Rick Savage each had their own personal moments to shine, sometimes together and also by themselves. The rhythm section handled a two-minute duet following "Switch 625," and Savage also had a brief solo segment before "Rock On," Def Leppard's highly energized cover of the David Essex classic. 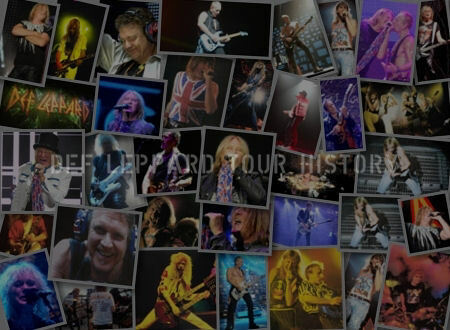 The entire Def Leppard production is a well-thought out and organized affair. All the band members (with the obvious exception of drummer Allen) -- perhaps from their years of doing in-the-round shows -- have mastered the art of working all parts of the stage throughout the evening. How much is orchestrated, how much is second nature and how much is pure spontaneity in the moment within the grand scheme of things is difficult to discern after all this time. It's still a great show all the way around. With all the same-set similarities over Def Leppard's USANA residency, at least there's some variety in the realm of bands rounding out the typical triple bill. Oh, wait ... it turns out that Monday's partners, Poison and Tesla, were also no strangers to the Def Leppard crowd. This is the third time Poison has appeared with Def Leppard at USANA since 2009, and Tesla has opened Def Leppard's triple bills the past three summers. Which is certainly no complaint. Both are energetic and fun live bands. It all makes for memorable evening of music. Sometimes, it seems, variety is overrated.